Description: Seven Swans a Swimming is brewed in limited quantities in honor of the holiday season every year. The Belgian-style Saison ale is made in the farmhouse tradition, using barley, water, Belgian yeast strains, spices, and an infusion of raisins. Tasting Notes: The beer is consistent with some of the best Saisons I’ve had in recent years. Like a good Saison, it is distinctly yeasty, subtle in terms of malt flavor, and has a some discernible coriander spice and sweetness to it. The added raisins certainly helps in this latter regard, providing a slight sugary hint that is a little reminiscent of barley wine. Definitely reminded me of the holiday season. 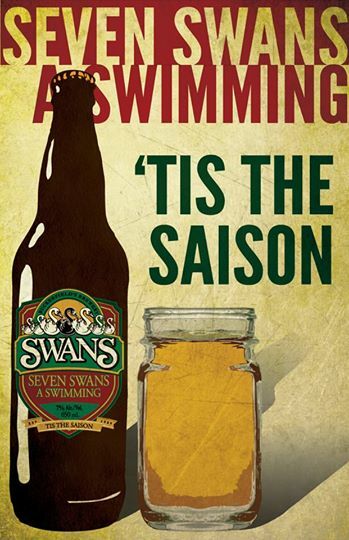 This entry was posted in BC Beer, Reviews, Seasonal Beer and tagged barley wine, Belgian Saison, belgian yeast, holiday beer, seasonal beer, Seven Swans a Swimming Tis the Saison, Swans Brewery by storiesbywilliams. Bookmark the permalink.